Starting next fall, astronauts on the International Space Station won't have to wait months for replacement parts to be launched from Earth. Instead, they can use a newly arrived 3D printer to fabricate the tools and materials they need. "The 3D printer that we're going to fly on space station will actually be the first-ever 3D printer in space," Niki Werkheiser, 3D Print project manager at NASA's Marshall Space Flight Center in Huntsville, Ala., said in a video about the space station 3D printer that posted online Oct. 30. The 3D printer headed to the space station in August 2014 — a joint project between NASA Marshall and the California-based company Made in Space — would be limited to parts only, rather than edible objects. When a tool on the space station breaks or goes missing these days, astronauts must often wait for months for the next supply mission to launch from Earth. The alternative is to ship up multiple spare parts, but the increased mass requires more fuel to lift off, and thus costs more money. A 3D printer could change all that, advocates say. The 3D printer sent to the International Space Station (ISS) will be able to utilize a variety of materials to craft items that the astronauts need, in a more timely manner. As an example, Werkheiser cited an unassuming part known as an extraction tool, which she said could be printed in under an hour. The part would have worked on the space station's Microgravity Science Glovebox (MSG), which was out of commission for six months in 2002 while astronauts waited for the needed part to be sent up on the next space shuttle flight. Another potential application would involve cubesats, tiny, low-cost satellites that hitch rides into space on other launches. According to Werkheiser, astronauts on the ISS could potentially print out and assemble many such satellites and manually launch them from the space station. The first 3D printer in space will be small enough to fit inside the MSG, and crewmembers aboard the orbiting lab will put their hands inside the glove box to operate it. NASA hopes the project demonstrates that 3D printing in space is as robust and reliable as it is on the ground, laying the foundation for a new in-space manufacturing industry. 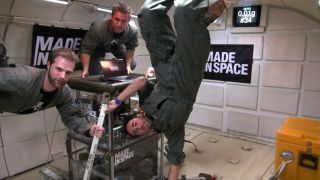 Made in Space has already tested some versions of the 3D printer during parabolic airplane flights, which produce short periods of microgravity. A long-term trial aboard the space station is the next step. "We're starting with plastic with this first printer, but we will be moving to metals and other types of materials," Werkheiser said. She pointed out that lessons learned from microgravity applications would be applicable on Earth, particularly for remote military outposts and on submarines. A 3D printer could be a key piece of equipment for missions traveling beyond Earth's orbit, advocates of the technology say. Rather than packing spare parts and materials that might be needed, astronauts could use the printer to produce what was needed. "For space station, it will decrease risk, decrease cost, and increase efficiency," Werkheiser said. "For longer-term missions for exploration, this is absolutely critical technology."